Home → General Information → Snack Time. Make it a Game Changer. Most three year olds are not familiar with hummus. But at Marian Hope we are trying to change that. Snack time during our preschool classes includes several uncommon items: cooked broccoli, cauliflower, guacamole, veggie straws and hummus just to name a few. We believe in introducing children at a young age to whole food nutrition and helping them discover snack foods that don’t have to come out of an individual sized bag. We also believe what you eat helps determine how you feel. And when we feel better, we are in a better place to listen, learn and grow. Peer Influence: Eating is a social part of our culture and even kids are in tune with this. When children see other children eating something they are unfamiliar with or previously thought they didn’t like, they are more likely to imitate and give it a try. Chaining: This involves taking something a child is already eating and introduce them to something they are not. For example, taking a pretzel stick and dipping it hummus. Stair Step Approach: Some children need a slower process that moves in small progressive increments towards eventually eating a new food. For instance, some children do not even want to see a strawberry. 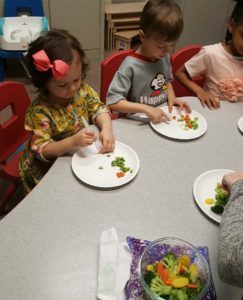 We start with simply having a strawberry present, then moving to having it on the child’s plate, to giving the strawberry a kiss to taking a bite and spitting out to finally eating the strawberry. All of this unfolds from the larger conversation that therapists are having with the children about food, nutrients, minerals and health. Because of our “whole-child” philosophy of treating children, we know fueling the body with whole food nutrition goes hand in hand. You cannot expect a race car to win a race on an empty tank. Many foods that are part the standard American diet are empty and void of vitamins and minerals found only in whole foods. Our body responds the same way a car does. The better quality you put in, the better the output in performance.